When people hear that we live in Switzerland, they often follow it with "Oh I love Interlaken!". We finally went when my sister, brother-in-law and nephew, Laurén, Matt and Henry, came to visit us in February. We weren't disappointed, but if we had to choose between the mountains surrounding Interlaken vs Interlaken itself, I would choose the small mountain towns. We left our home in Coppet early in the morning and drove to Interlaken. The drive itself took about 2.5 hours. We parked near the Interlaken Ost train station and explored the small town. We used Rick Steve's walking tour which took about 45 minutes to complete. 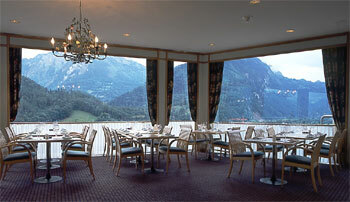 After the tour, we made our way to the Metropole Hotel Interlaken for lunch in their panoramic view restaurant. The building itself is not very pretty. It is a concrete high rise among smaller more quaint hotels and restaurants that make up the town, but because of its height it offers fantastic views of the peaks it is surrounded by in its top floor restaurant. It was a bit chilly and we used the opportunity to warm up while eating lunch, otherwise the outdoor patio that surrounds the top-floor restaurant would also be a lovely place to eat. After lunch, we went back to our car and drove to Lauterbrunnen. Lauterbrunnen sits in a small valley below towering mountains around it. From Lauterbrunnen we took the cable car up to Gimmelwald. Gimmelwald was the first town that sits above Lauterbrunnen. You have the option of transferring to a different cable car to go to towns even higher, however we decided on stopping in Gimmelwald. Gimmelwald is a tiny mountain town with only 120 local residents. It is pedestrian only and can be explored in just a couple hours. There are several charming places including the Honesty Shop, restaurants that advertise brownies, and small farms that sell local eggs, milk and cheese. Open from 9:00 AM - 6:00 PM daily. Honest System - pick what you want and leave the money in a box before you leave. The town is quiet and the children had fun running freely while we didn't have to worry about cars. For link to our photo album from Gimmelwald click Here.